Cook JA, Terrell S, JonikasJA. 2004. 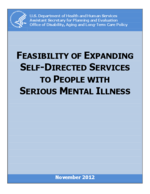 Promoting Self-Determination for Individuals with Psychiatric Disabilities through Self-Directed Services: A Look at Federal, State and Public Systems as Sources of Cash-Outs and Other Fiscal Expansion Opportunities. Rockville, MD: Substance Abuse and Mental Health Services Administration. Koyanagi C, Alfano E, Carty L. 2008. In The Driver's Seat: A Guide to Self-Directed Mental Health Care. Washington, DC: Bazelon Center for Mental Health Law and UPENN Collaborative on Community Integration. President's New Freedom Commission on Mental Health. 2003. Achieving the Promise: Transforming Mental Health Care in America. Final Report. Rockville, MD: Substance Abuse and Mental Health Services Administration, DHHS Pub. No. SMA-03-3832. Simon-Rusinowitz L, Hofland BF. 1993. Adopting a disability approach to home care services for older adults. Gerontologist, 33(2):159-167. Batavia AI. 2002. Consumer direction, consumer choice, and the future of long-term care. Journal of Disability Policy Studies, 13(2):67-74. Grob GN. 1995. The paradox of deinstitutionalization. Society, 32(5):51-59. Tomes N. 2006. The patient as a policy factor: A historical case study of the consumer/survivor movement in mental health. Health Affairs, 25(3):720-729. Cook JA. 2005. "Patient-Centered" and "Consumer-Directed" Mental Health Services. Washington, DC: Institute of Medicine, Committee on Crossing the Quality Chasm--Adaptation to Mental Health and Addictive Disorders. Conroy JW, YuskauskasA. 1996. Independent Evaluation of the Monadnock Self Determination Project. Narberth, PA: The Center for Outcome Analysis. Conroy JW, Fullerton AY, Brown M, Garrow J. 2002. Outcomes of the Robert Wood Johnson Foundation's National Initiative on Self-Determination for Persons with Developmental Disabilities: Final Report on 3 Years of Research and Analysis. Narberth, PA: Center for Outcome Analysis. Bradley V, Agosta J, Smith G, Taub S, AshbaughJ, Silver J, Heaviland M. 2001. The Robert Wood Johnson Foundation Self-Determination Initiative: Final Impact Assessment Report. Cambridge, MA: The Human Services Research Institute. Doty P, Mahoney KJ, Simon RusinowitzL. 2007 Designing the Cash and Counseling demonstration and evaluation. Health Services Research, 42(1p2):378-396. Carlson BL, Foster L, Dale SB, Brown R. 2007. Effects of Cash and Counseling on personal care and well-being. Health Services Research, 42(1p2):467-487. Dale S, Brown R, Phillips B, Schore J, Carlson BL. 2003. The effects of Cash and Counseling on personal care services and Medicaid costs in Arkansas. Health Affairs, W3-566-W3-575. Dale SB, Brown RS. 2007. How does cash and counseling affect costs? Health Services Research, 42(1p2):488-509. Foster L, Dale SB, Brown R. 2007. How caregivers and workers fared in cash and counseling. Health Services Research, 42(1):510-532. Brown RS, Dale SB. 2007. The research design and methodological issues for the cash and counseling evaluation. Health Services Research, 42(1p2):414-445. Kemper P. 2007. Commentary: Social experimentation at its best: The cash and counseling demonstration and its implications. Health Services Research, 42(1 Pt 2):577-586. Spaulding-Givens J. 2011. Florida Self-Directed Care: An Exploratory Study of Participants' Characteristics, Goals, Service Utilization, and Outcomes. Florida State University, College of Social Work. Institute of Medicine. 2006. Improving the Quality of Health Care for Mental and Substance-Use Conditions: Quality Chasm Series. Washington, DC: The National Academies Press. Corrigan PW. 2002. Empowerment and serious mental illness: Treatment partnerships and community opportunities. Psychiatric Quarterly, 73(3):217-228. Adams JR, Drake RE. 2006. Shared decision-making and evidence-based practice. Community Mental Health Journal, 42:87-105. Druss BG, Marcus SC, Rosenheck RA, Olfson M, Tanielian T, Pincus HA. 2000. Understanding disability in mental and general medical conditions. American Journal of Psychiatry, 157(9):1485-1491. Adams J, Drake R, Wolford G. 2007. Shared decision-making preferences of people with severe mental illness. Psychiatric Services, 58:1219-1221. Elmendorf DW. 2011. Analysis of the Major Health Care Legislation Enacted in March 2010. Washington, DC: Congressional Budget Office. Garfield RL, ZuvekasSH, Lave JR, Donohue JM. 2011. The impact of national health care reform on adults with severe mental disorders. American Journal of Psychiatry, 168:486-494. Mann C. 2010. CMS Letter to State Medicaid Directors: Improving Access to Home and Community-Based Services. Baltimore, MD: Centers for Medicare and Medicaid Services, Center for Medicaid, CHIP, and Survey and Certification. U.S. Department of Health and Human Services. 1999. Mental Health: A Report of the Surgeon General. Rockville, MD: U.S. Department of Health and Human Services, Substance Abuse and Mental Health Services Administration and the National Institute of Mental Health. Sharma T, Antonova L. 2003. Cognitive function in schizophrenia. Deficits, functional consequences, and future treatment. Psychiatric Clinics of North America, 26(1):25-40. Velligan DI, Mahurin RK, Diamond PL, Hazleton BC, Eckert SL, Miller AL. 1997. The functional significance of symptomatologyand cognitive function in schizophrenia. Schizophrenia Research, 25(1):21-31. Dickerson FB. 1997. Assessing clinical outcomes: The community functioning of persons with serious mental illness. Psychiatric Services, 48(7):897-902. Stefan S. 2004. Competence Issues in Self-Directed Care. Newton, MA: Center for Public Representation. Swanson JW, Swartz MS, ElbogenEB, Van Dorn RA, Wagner HR, Moser LA, Wilder C, Gilbert AR. 2008. Psychiatric advance directives and reduction of coercive crisis interventions. Journal of Mental Health, 17(3):255-267. Henderson C, Swanson J, SzmuklerG, Thornicroft G, ZinklerM. 2008. A typology of advance statements in mental health care. Psychiatric Services, 59(1):63-71. Swanson J, Swartz M, FerronJ, Elbogen E, Van Dorn R. 2006. Psychiatric advance directives among public mental health consumers in five US cities: Prevalence, demand, and correlates. Journal of the American Academy of Psychiatry and the Law Online, 34(1):43-57. Swanson JW, Van McCrary S, Swartz MS, Elbogen EB, Van Dorn RA. 2006. Superseding psychiatric advance directives: Ethical and legal considerations. Journal of the American Academy of Psychiatry and the Law Online, 34(3):385-394. Green MF. 1996. What are the functional consequences of neurocognitive deficits in schizophrenia? American Journal of Psychiatry, 153(3):321-330. Rosenheck R, Leslie D, Keefe R, McEvoy J, Swartz M, Perkins D, Stroup S, Hsiao JK, Lieberman J. 2006. Barriers to employment for people with schizophrenia.American Journal of Psychiatry, 163(3):411-417. Rosenheck R, Stroup S, Keefe RSE, McEvoy J, Swartz M, Perkins D, Hsiao J, Shumway M, Lieberman J. 2005. Measuring outcome priorities and preferences in people with schizophrenia. British Journal of Psychiatry, 187(6):529-536. Resnick SG, Rosenheck RA, Lehman AF. 2004. An exploratory analysis of correlates of recovery. Psychiatric Services, 55(5):540-547. Swartz M, Perkins D, Stroup T, Davis S, Capuano G, Rosenheck R, Reimherr F, McGee M, Keefe R, McEvoy J. 2007. Effects of antipsychotic medications on psychosocial functioning in patients with chronic schizophrenia: Findings from the NIMH CATIE study. American Journal of Psychiatry, 164(3):428-436. Granholm E, McQuaid JR, McClure FS, AuslanderLA, Perivoliotis D, PedrelliP, Patterson T, Jeste DV. 2005. A randomized, controlled trial of cognitive behavioral social skills training for middle-aged and older outpatients with chronic schizophrenia. American Journal of Psychiatry, 162(3):520-529. Brown AH, Cohen AN, ChinmanMJ, Kessler C, Young AS. 2008. EQUIP: Implementing chronic care principles and applying formative evaluation methods to improve care for schizophrenia: QUERI series. Implementation Science, 3(9), doi:10.1186/1748-5908-3-9. Young AS, Mintz J, Cohen AN. 2004. Clinical computing: Using information systems to improve care for persons with schizophrenia. Psychiatric Services, 55(3):253-255, doi: 10.1176/appi.ps.55.3.253. Chinman M, Young AS, Schell T, Hassell J, MintzJ. 2004. Computer-assisted self-assessment in persons with severe mental illness. Journal of Clinical Psychiatry, 65(10):1343-1351. Chinman M, Hassell J, Magnabosco J, Nowlin-Finch N, Marusak S, Young AS. 2007. The feasibility of computerized patient self-assessment at mental health clinics. Administration and Policy in Mental Health and Mental Health Services Research, 34(4):401-409. Elbogen EB, Swanson JW, Swartz MS. 2003. Effects of legal mechanisms on perceived coercion and treatment adherence among persons with severe mental illness. Journal of Nervous and Mental Disease, 191(10):629-637. Goldman HH, Azrin ST. 2003. Public policy and evidence-based practice. Psychiatric Clinics of North America, 26(4):899-917. Ganju V. 2003. Implementation of evidence-based practices in state mental health systems. Schizophrenia Bulletin, 29(1):125-131. Rapp CA, Bond GR, Becker DR, CarpinelloSE, Nikkel RE, Gintoli G. 2005. The role of state mental health authorities in promoting improved client outcomes through evidence-based practice. Community Mental Health Journal, 41(3):347-363. Berwick DM. 2011. Launching accountablecare organizations--the proposed rule for the Medicare shared savings program. New England Journal of Medicine, 364(e32). Watson AC, Corrigan P, Larson JE, Sells M. 2007. Self-stigma in people with mental illness. Schizophrenia Bulletin, 33(6):1312-1318. Cook J, Copeland ME, Hamilton M, Jonikas J, Razzano L, Floyd C, Hudson W, Macfarlane R, Grey D. 2009. Initial outcomes of a mental illness self-management program based on wellness recovery action planning. Psychiatric Services, 60(2):246-249. Druss BG, Zhao L, von Esenwein SA, Bona JR, Fricks L, Jenkins-Tucker S, Sterling E, DiClemente R, Lorig K. 2010. The health and recovery peer(HARP) program: A peer-led intervention to improve medical self-management for persons with serious mental illness. Schizophrenia Research, 118(1-3):264-270. Doty P, Mahoney KJ, SciegajM. 2010. New state strategies to meet long-term care needs. Health Affairs, 29(1):49-56. Cook JA, Russell C, Grey DD, JonikasJA. 2009. Economic grand rounds: A self-directed care model for mental health recovery. Psychiatric Services, 59(6):600-602. Rosenbaum S, TeitelbaumJ. 2004. Olmstead at Five: Assessing the Impact. Washington, DC: Kaiser Commission on Medicaid and the Uninsured, Henry J. Kaiser Family Foundation, 1-27. Crawley JS. 2003. An Overview of the Independence PlusInitiative to Promote Consumer-Direction of Services in Medicaid. Washington, DC: The Henry J. Kaiser Family Foundation. Smith DG. 2007. CMS Letter to State Medicaid Directors, SMDL #07-013. Baltimore, MD: Centers for Medicare and Medicaid Services, Center for Medicaid and State Operations. Centers for Medicare and Medicaid Services. 2008. Medicaid program: Self-directed personal assistance services program state plan option (cash and counseling). Federal Register, 73(13): 3546-3566. Centers for Medicare and Medicaid Services. 2011. Medicaid program: Community First Choice Option. Federal Register, 76(38):10736-10753. Wishon-Siegwarth AA, Koyanagi C. 2011. The new Health Care Reform Act and Medicaid: New opportunities for psychiatric rehabilitation. Psychiatric Rehabilitation Journal, 34(4):277-284. NASMHPD. 2011. FY2009 State Mental Health Revenue and Expenditure Study Results. Falls Church, VA: NRI. Office of Program Policy Analysis and Government Accountability. 2010. Insufficient Information Available to Fully Assess the Success of the Self-Directed Care Program. Tallahassee, FL: OPPAGA,10-40. Sullivan A. 2006. Empowerment Initiatives Brokerage Service: Quality and Outcome Evaluation. Salem, OR: Oregon Technical Assistance Corporation. Ellison ML, Rogers ES, LyassA, Massaro J, Wewiorski NJ, Hsu ST, Anthony WA. 2011. Statewide initiative of intensive psychiatric rehabilitation: Outcomes and relationship to other mental health service use. Psychiatric Rehabilitation Journal, 35(1):9-19. Michigan Department of Community Health. 2008. Choice Voucher System: Self-Determination Technical Advisory, Version 2.0. Lansing, MI: Mental Health and Substance Abuse Administration. O'Brien D, Ford L, Malloy J. 2005. Person centered funding: Using vouchers and personal budgets to support recovery and employment for people with psychiatric disabilities. Journal of Vocational Rehabilitation, 23(2):71-79. Cloutier H, Mallory J,Hagner D, Cotton P. 2006. Choice and control over resources: New Hampshire's individual career account demonstration projects. Journal of Rehabilitation, 72(2):4-11. Cook JA, Shore SE, Burke-Miller JK, Jonikas JA, Ferrara M, ColegroveS, Norris WT, Ruckdeschel B, BatteigerAP, Ohrtman M. 2010. Participatory action research to establish self-directed care for mental health recovery in Texas. Psychiatric Rehabilitation Journal, 34(2):137-144.